The Mozilla Foundation is unabashedly committed to a free and open web. They see it as a vital part of a healthy digital ecosystem where creativity and innovation can thrive. We couldn’t agree more. And we couldn’t be prouder to have Mozilla’s generous and ongoing support. 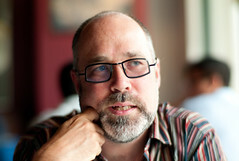 We were recently able to catch up with Mark Surman, the Foundation’s Executive Director, who talks about Mozilla and its myriad projects, and how his organization and ours are a lot like lego blocks for the open web. Most people associate Mozilla with the Firefox but you do much more than just that – can you give our readers some background on the different arms of Mozilla as an organization? What is your role there? Mozilla’s overall goal is to promote innovation and opportunity on the web — and to guard the open nature of the internet. Firefox is clearly the biggest part of this. But we’re constantly looking for new ways to make the internet better. Our growing focus on identity, mobile and web apps is a part of this. Also, we’re reaching out more broadly beyond software to invite people like filmmakers, scientists, journalists, teachers and so on to get involved. Personally, I’m most active in this effort to reach out more broadly and to get many more people involved in our work. Much of this is happening through a program I helped start called Mozilla Drumbeat. As Executive Director of Mozilla Foundation, I also manage the overall umbrella legal structure for all of Mozilla’s activities. What is the connection between Mozilla and CC? Do you use our tools in your various projects? At the highest level, Mozilla and CC are both working for the same thing — a digital society based on creativity, innovation and freedom. And, of course, we use CC licenses for content and documents that we produce across all Mozilla projects. Mozilla has given generously to Creative Commons – what was the motivation behind donating? What is it about CC that you find important? I think of both organizations as giving people ‘lego blocks’ that they can use to make and shape the web. Mozilla’s lego blocks are technical, CC’s are legal. Both help people create and innovate, which goes back to the higher vision we share. What do you see as CC’s role in the broader digital ecosystem? How does CC enable Mozilla to better innovate in that space? We need an organization like CC to make sure that the content layer of the web is as open and free as the core tech upon which it’s all built. It’s at this content layer that most people ‘make the web’ — it’s where people feel the participatory and remixable nature of the web. Keeping things open and free at this level — and making them more so — is critical to the future of the open web. Help ensure a bright future for the open web and donate to Creative Commons today.